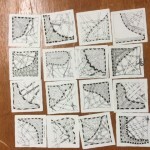 Zentangle: Now I Get it! I have often wondered about Zentangle. Is it just doodling? Why are people coming up with another name for doodling? I just didnt’ get it. People I asked would reply, “What do you mean, you don’t get it?” I just didn’t understand what it was and what it was all about. So, when I saw a class offered at the Indiana Heritage Quilt Show in nearby Bloomington, IN, I decided to find out. 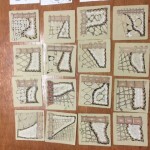 I signed up for two one day back to back classes with Certified Zentangle Teacher, Nysha Oren Nelson. 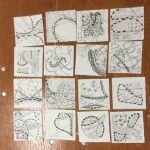 Thursday’s class was an introduction to Zentangle. This was an enlightening experience for me and now I get it! Your brain can only think about one thing at a time (I always thought I was fabulous at multi-tasking!) and so concentrating on drawing particular Tangles for some amount of time is similar to a form of meditation and takes your mind off of everything else that’s going on up there. And there is a process and it’s NOT just doodling. And it does clear your mind for that amount of time. 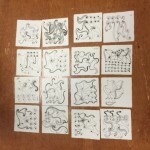 Here are some of our class samples of the Tangle patterns we learned. We all followed the same directions and drew the same tangles, but they all came out differently. 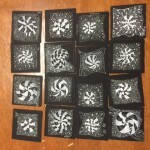 Friday’s class was adapting the art of Zentangle to free motion quilting. Free motion quilting can be daunting for me. I can practice and get to the point that I feel comfortable doing it, but if I don’t practice regularly I have to start all over the next time. 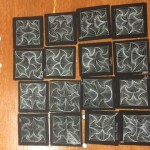 I did find the Zentangle patterns lend themselves will to FMQ and am excited about the possibilities. I believe warming up with drawing the Tangles will also translate into better FMQ. I can definitely see myself using this in the future. Super fun to teach classes in my new studio!!! I was having so much fun, though, I forgot to take pictures! Here’s the only one I remembered to take. 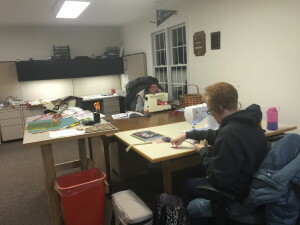 This was the second class of two, so they were finishing up their Candle Mats. The did a super job! 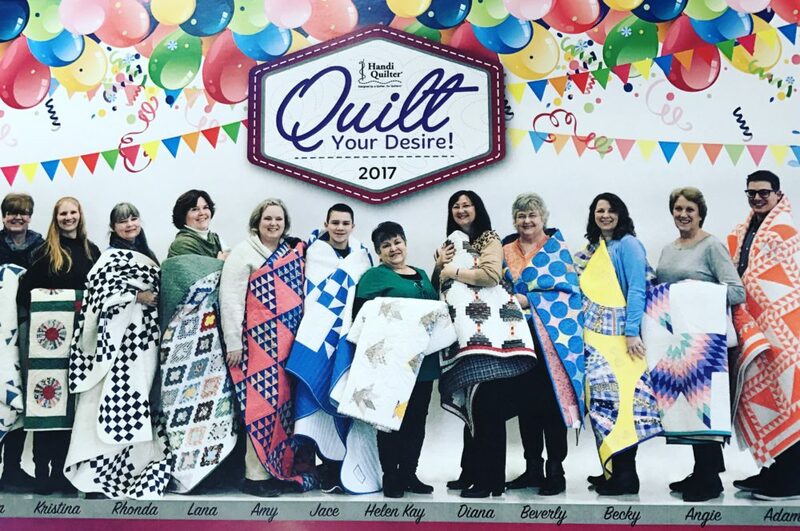 Looking forward to sewing with them in the future.